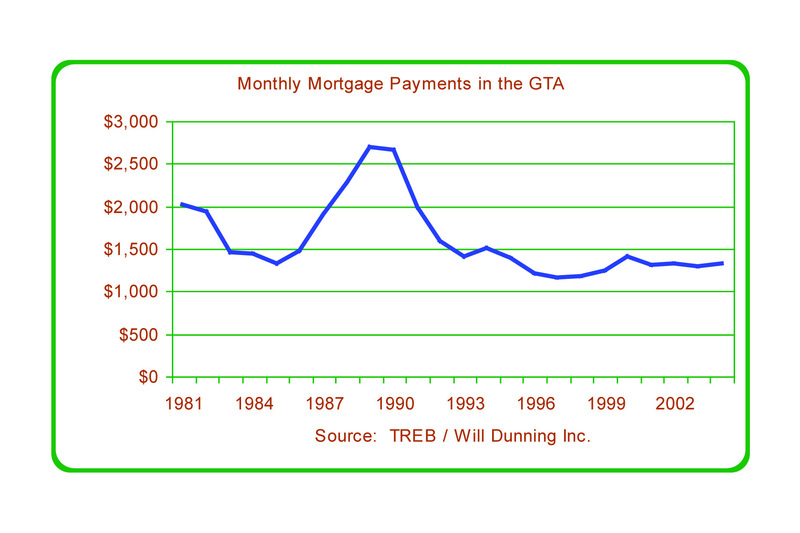 Figure 6 illustrates the effect of the employment rate on the GTA housing market cycle. In the early 1990s, a weak employment situation (heavy job losses early in the decade, followed by a halting recovery until the mid 1990s) resulted in low housing demand. Starting in 1994, the GTA economy began to recover rapidly from the recession. Between December 1994 and December 2000, 492,000 jobs were created in the GTA, representing an average of 82,000 jobs per year, or 3.5 percent per year. This growth rate was faster than the population growth rate. The rate of job creation has since slowed. During this expansionary period, the number of people who had recently become employed rose and resulted in an increasing number of people who were in a position to buy homes. This trend resulted in expanding sales for new and resale homes. Employment can also be expressed as the percentage of adults who are employed: the employment rate. 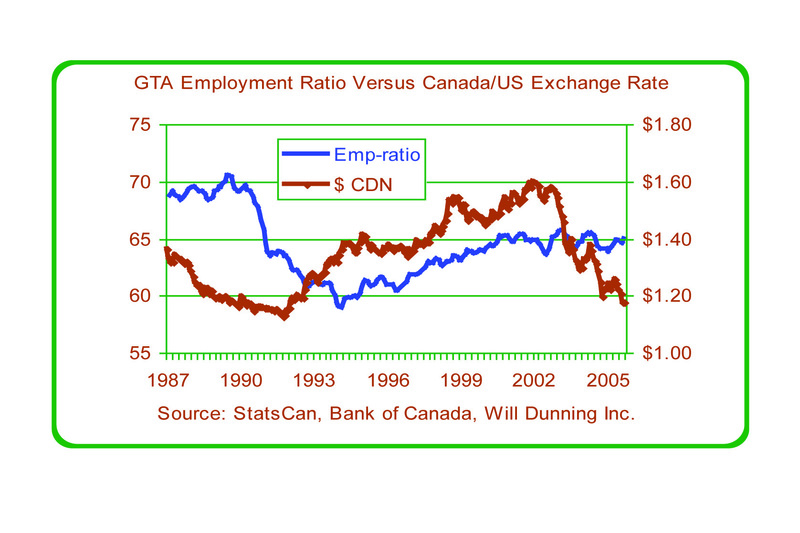 Figure 7 shows that the employment rate for the GTA rose during the late 1990s and peaked about 2001. It is difficult to see a conclusive trend after 2001, but the period of strong growth appears to have ended. Figure 8 shows data on the affordability of homeownership in the Greater Toronto Area, using data on house prices reported by the Toronto Real Estate Board. The graph shows the average monthly mortgage payment (in inflation-adjusted or "real" dollars) for the period 1981 to 2003. Between 1995 and 1997, the average monthly cost fell to the lowest level since the start of the data set in 1981. While it rose slightly in 1999 and 2000, it remains at a quite low level compared to earlier years. This represents good housing affordability. The persistence of the trend during the second half of the 1990s and the early 21st century coincided with the expanding numbers of recently employed people and contributed to rising levels of housing demand from 1995 to 2002. The economy was recovering from a harsh recession. Low interest rates encouraged spending and investment by companies and individuals. The strong stock market encouraged job creation in the GTA in at least three ways -- by increasing activity and employment in the financial services industry; by making it easier for companies to raise money and expand; and by encouraging consumers to spend their increased wealth. The strong housing market resulted in job creation in the construction industry. Rising house prices created a wealth effect that encouraged consumer spending. The U.S. dollar was rising relative to the Canadian dollar. This made it easier for Canadian companies to export goods to the United States. It also improved Canadian competitiveness in services, encouraging U.S. companies to buy services in Canada and U.S. tourists to visit Canada while discouraging Canadians from visiting the U.S. and from buying U.S. goods and services. Beginning in 1986, and up to mid-1992, the U.S. dollar weakened relative to the Canadian dollar. Employment in the GTA peaked in 1989 (three years after the exchange rates began to change) and then dropped sharply. The shift in exchange rates was certainly not the only negative factor -- double-digit interest rates and the implementation of the Canada-U.S. Free Trade Agreement also hammered the GTA economy. In late 1991, the exchange rate changed direction and the Canadian dollar weakened relative to the U.S. dollar. 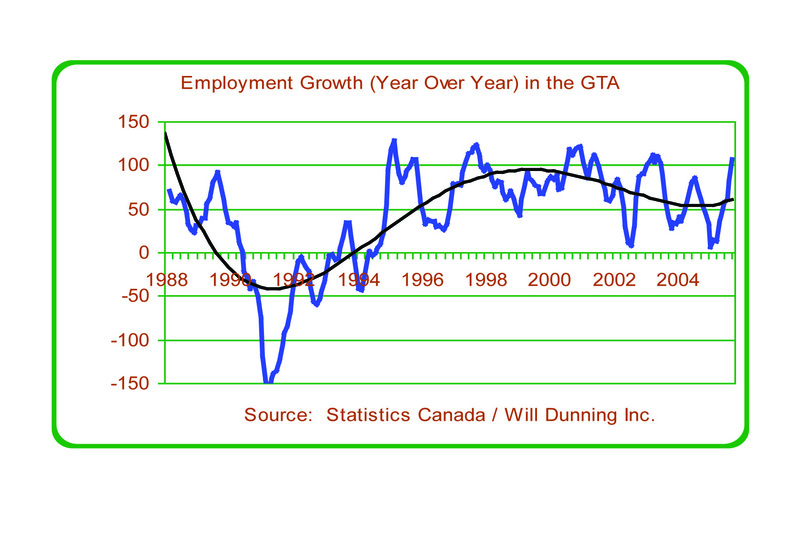 In early 1994, employment in the GTA began to recover. Low interest rates also contributed to the recovery. Through the second half of the 1990s, the U.S. dollar continued to strengthen relative to the Canadian dollar, which contributed to the increase in the GTA's employment-to-population ratio. 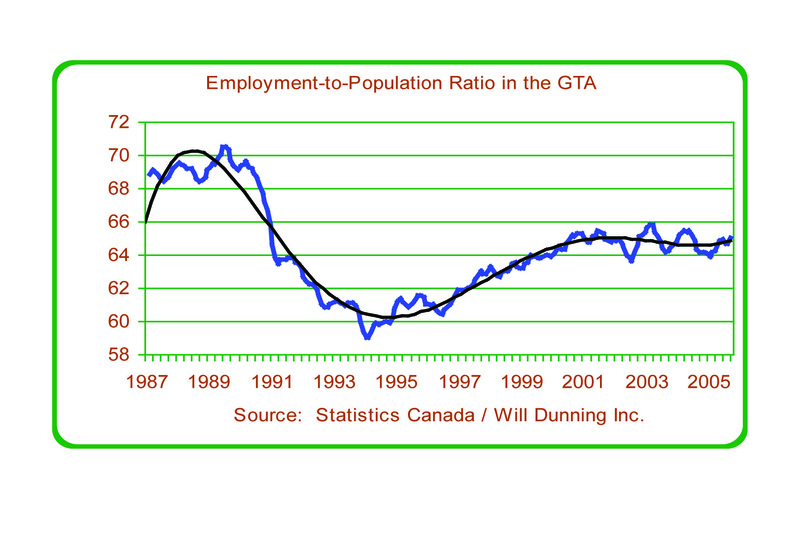 Since 2001, the GTA's employment-to-population ratio has not increased in a sustained way. This economic slowdown is most likely due, initially, to the bursting of the stock market bubble in late 2000. At the end of 2002, the exchange rates changed direction. Since then, the U.S. dollar has weakened relative to the Canadian dollar. As of 2005, signs are emerging that employment in the GTA has been affected, particularly in the goods-producing sector. While total employment is growing, the rate of growth is slower than that of adult population and the employment rate has fallen. Taken together, these data suggest that the GTA's economic expansion of the late 1990s was the product of an unusual combination of factors. It is unlikely that this expansion trend can continue in the long term.